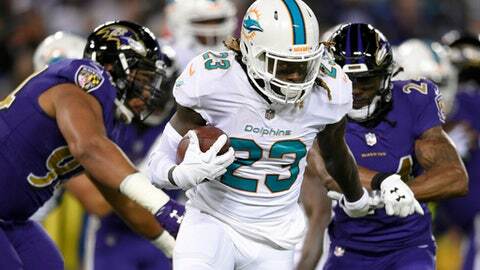 Jay Ajayi went to the Pro Bowl last season after running for 1,272 yards, including three 200-yard games. PHILADELPHIA (AP) — The NFL-leading Eagles bolstered their running attack Tuesday, acquiring Jay Ajayi from the Miami Dolphins for a 2018 fourth-round draft pick hours before the trade deadline. Ajayi has 465 yards rushing and is averaging 3.4 yards per carry with no touchdowns. He went to the Pro Bowl last season after running for 1,272 yards, including three 200-yard games. Dolphins coach Adam Gase signaled his displeasure with Ajayi last week after Miami was routed 40-0 at Baltimore, noting missed blocking assignments in pass protection . LeGarrette Blount leads Philadelphia with 467 yards rushing and is averaging 4.7 yards a carry with two touchdowns. Roseman said Blount remains the starter and he’s confident Ajayi won’t create problems. The Eagles (7-1) have the fifth-ranked run offense and have won six straight games. On Monday, coach Doug Pederson wasn’t sure the team needed any help. Ajayi fits the “special” category despite his inconsistent season. He had 122 yards rushing in Week 2 and 130 in Week 6. Last year, Ajayi was lauded for his durability and ability to break tackles. He helped the Dolphins reach the playoffs for the first time since 2008, and joined O.J. Simpson, Earl Campbell and Tiki Barber as the only players to rush for 200 yards three times in a season. The London-born Ajayi wasn’t drafted until the fifth round in 2015 because of a knee issue, but he has averaged 18 carries a game the past two seasons and has made 19 consecutive starts. Ajayi has been held out of practice a lot this year to protect his knees, and the Dolphins may have doubts about his longevity. The Dolphins (4-3) needed a shake-up. They’re in the playoff race even though they rank last in the NFL in points and yards. With Ajayi gone, Damien Williams and Kenyan Drake are expected to share duties at running back Sunday against Oakland. The Eagles have to make a roster spot for Ajayi. Wendell Smallwood, Corey Clement and Kenjon Barner are the other running backs on the roster. They lost Darren Sproles for the season in Week 3.